At the beginning of the story, Earth's residents are unaware that the human species on Earth and countless other planets were established by families of transhuman and alien royalty for the purpose of later "harvesting" the resulting organisms to produce a type of youth serum for the elites on still other planets. After the death of the matriarch of the House of Abrasax, the most powerful of the alien dynasties, her children, Balem (Eddie Redmayne), Kalique (Tuppence Middleton), and Titus (Douglas Booth), quarrel over the inheritance, with Balem inheriting an enormous refinery on Jupiter and Titus declaring his intention to dismantle the youth serum trade, of which Earth is the next intended source. Protagonist Jupiter Jones narrates that her father, Maximilian Jones (James D'Arcy), met her mother, Aleksa (Maria Doyle Kennedy), in Saint Petersburg. After Maximilian is killed in a robbery, Aleksa names their daughter Jupiter, after his dying wish, and they move to Chicago to live with Aleksa's family. Many years later, Jupiter (Mila Kunis) works with Aleksa and her Aunt Nino (Frog Stone) to clean the homes of wealthy neighbors. To buy a telescope, Jupiter agrees to sell her eggs with the help of her cousin Vladie (Kick Gurry), under the name of her friend Katharine Dunlevy (Vanessa Kirby). At Katharine's house, Jupiter and Katharine are attacked by extraterrestrial 'Keepers'; and when Jupiter photographs these, they erase her memory of the incident. During the egg donation procedure, the doctors and nurses are identified as Balem's agents, sent to kill her, and she is saved by Caine Wise (Channing Tatum), a former soldier sent by Titus. Stinger Apini (Sean Bean), an old comrade of Caine's, agrees to help Jupiter, but a group of hunters take her to Kalique's palace on a distant planet, where Kalique explains that Jupiter is genetically identical to the dead matriarch, and therefore the Earth's rightful owner. Supported by Captain Diomika Tsing (Nikki Amuka-Bird) of the Aegis (an intergalactic police force), Caine retrieves her from Kalique, and brings her to the planet Ores (the intergalactic capital city) to claim her inheritance. 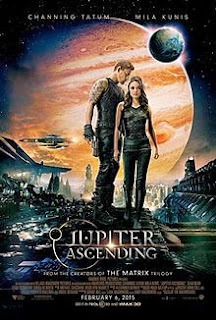 On the way back to Earth, Titus detains Jupiter and Caine, to whom he reveals his plan to marry and then kill Jupiter and claim Earth before throwing Caine into the void; but Caine survives and saves Jupiter at the altar. Jupiter asks to return home, but learns that her family has been taken hostage by Balem. In his refinery in the Great Red Spot, Balem demands Earth in exchange for Jupiter's family. Realizing that Balem can "harvest" Earth only with her permission, Jupiter refuses. Balem tries to kill Jupiter; but she defeats him in a fight, and is rescued by Caine, Stinger, and Tsing. Jupiter's family is returned home with no memory of their disappearance, while Jupiter secretly retains ownership of the Earth. Her family buys her the telescope she wanted and Caine receives a pair of wings earlier removed from his body.